A notebook is a collection of runnable cells (commands). When you use a notebook, you are primarily developing and running cells. All notebook tasks are supported by UI actions, but you can also perform many tasks using keyboard shortcuts. Toggle the shortcut display by clicking the icon or selecting ? > . This section describes how to develop notebook cells and navigate around a notebook. and two actions: Hide and Delete . To add a cell, mouse over a cell at the top or bottom and click the icon, or access the notebook cell menu at the far right, click , and select Add Cell Above or Add Cell Below. Go to the cell actions menu at the far right and click (Delete). You can override the primary language by specifying the language magic command %<language> at the beginning of a cell. The supported magic commands are: %python, %r, %scala, and %sql. When you invoke a language magic command, the command is dispatched to the REPL in the execution context for the notebook. Variables defined in one language (and hence in the REPL for that language) are not available in the REPL of another language. REPLs can share state only through external resources such as files in DBFS or objects in blob storage. Allows you to execute shell code in your notebook. Add the -e option in order to fail the cell (and subsequently a job or a run all command) if the shell command has a non-zero exit status. Allows you to use dbutils filesystem commands. For more information, see Access DBFS with dbutils. Allows you to include various types of documentation, including text, images, and mathematical formulas and equations. Cells that appear after cells containing Markdown headings can be collapsed into the heading cell. The following image shows a level-one heading called Heading 1 with the following two cells collapsed into it. To expand and collapse headings, click the + and -. Also see Hide and show cell content. You can include HTML in a notebook by using the function displayHTML. See HTML, D3, and SVG in Notebooks for an example of how to do this. The displayHTML iframe is served from the domain databricksusercontent.com and the iframe sandbox includes the allow-same-origin attribute. databricksusercontent.com must be accessible from your browser. If it is currently blocked by your corporate network, it will need to be whitelisted by IT. You can have discussions with collaborators using command comments. To toggle the Comments sidebar, click the Comments button at the top right of a notebook. Add your comment and click Comment. To edit, delete, or reply to a comment, click the comment and choose an action. 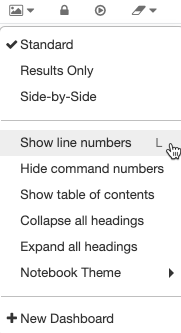 To show line numbers or command numbers, click View > Show line numbers or View > show command numbers. Once they’re displayed, you can hide them again from the same menu. You can also enable line numbers with the keyboard shortcut Control+L. If you enable line or command numbers, Databricks saves your preference and shows them in all of your other notebooks for that browser. Command numbers above cells link to that specific command. If you click on the command number for a cell, it updates your URL to be anchored to that command. If you want to link to a specific command in your notebook, right-click the command number and choose copy link address. To find and replace text within a notebook, select File > Find and Replace. The current match is highlighted in orange and all other matches are highlighted in yellow. You can replace matches on an individual basis by clicking Replace. You can switch between matches by clicking the Prev and Next buttons or pressing shift+enter and enter to go to the previous and next matches, respectively. Close the find and replace tool by clicking the x button or by pressing esc. 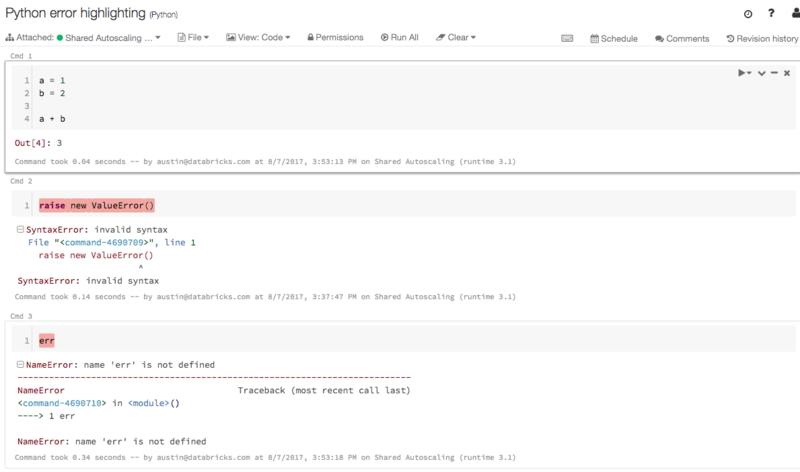 You can use Databricks autocomplete features to automatically complete code segments as you enter them in cells. This reduces what you have to remember and minimizes the amount of typing you have to do. 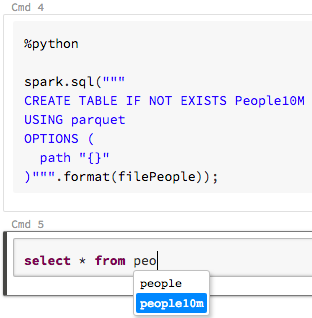 Databricks supports two types of autocomplete in your notebook: local and server. Local autocomplete completes words that exist in the notebook. Server autocomplete is more powerful because it accesses the cluster for defined types, classes, and objects, as well as SQL database and table names. To activate server autocomplete, you must attach your attach a notebook to a cluster and run all cells that define completable objects. Server autocomplete in Scala, Python, and R notebooks is blocked during command execution. Server autocomplete is not available for high concurrency clusters. You trigger autocomplete by pressing Tab after entering a completable object. For example, after you define and run the cells containing the definitions of MyClass and instance, the methods of instance are completable, and a list of valid completions displays when you press Tab. Type completion and SQL database and table name completion work in the same way. This section describes how to run one or more notebook cells. The notebook must be attached to a cluster. If the cluster is not running, the cluster is started when you run one or more cells. In the cell actions menu at the far right, click and select Run Cell, or press shift+Enter. The maximum size for a notebook cell, both contents and output, is 16MB. By default, when you run a cell, the notebook automatically attaches to a running cluster without prompting. To change this setting, select > User Settings > Notebook Settings. 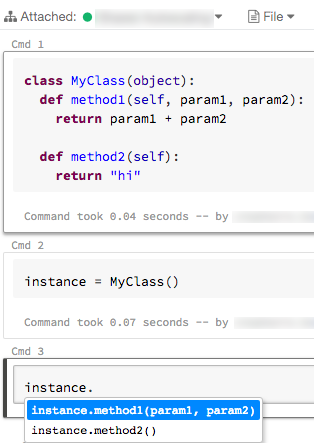 For example, try executing these Python code snippets that reference the predefined variables. To run all cells above or below a cell, go to the cell actions menu at the far right, click , and select Run All Above or Run All Below. Run All Below includes the cell you are in. Run All Above does not. To run all the cells in a notebook, select Run All in the notebook toolbar. Do not do a Run All if steps for mount and unmount are in the same notebook. It could lead to a race condition and possibly corrupt the mount points. Python and Scala notebooks support error highlighting. That is, the line of code that is throwing the error will be highlighted in the cell. 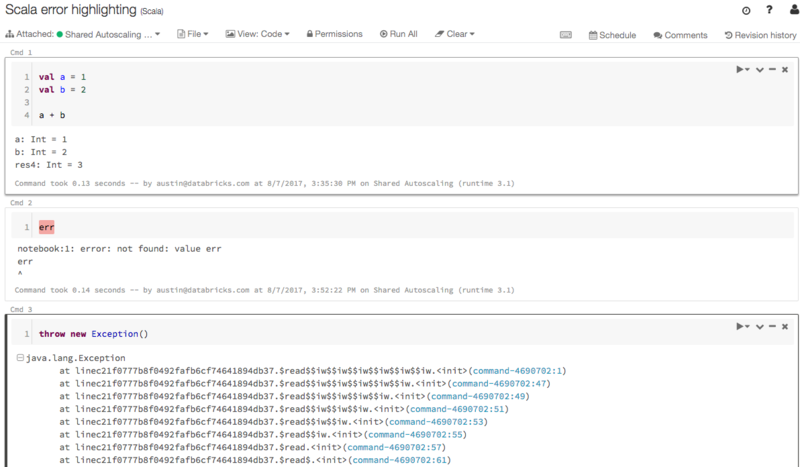 Additionally, if the error output is a stacktrace, the cell in which the error is thrown is displayed in the stacktrace as a link to the cell. You can click this link to jump to the offending code. Notifications alert you to certain events, such as which command is currently running during Run all cells and which commands are in error state. When your notebook is showing multiple error notifications, the first one will have a link that allows you to clear all notifications. Notebook notifications are enabled by default. You can disable them under > User Settings > Notebook Settings. You can run a notebook from another notebook by using the %run <notebook> magic command. This is roughly equivalent to a :load command in a Scala REPL on your local machine or an import statement in Python. All variables defined in <notebook> become available in your current notebook. %run must be in a cell by itself, because it runs the entire notebook inline. You cannot use %run to run a Python file and import the entities defined in that file into a notebook. To import from a Python file you must package the file into a Python library, create a Databricks library from that Python library, and install the library into the cluster you use to run your notebook. Even though you did not define x in notebookB, you can access x in notebookB after you run %run notebookA. To specify a relative path, preface it with ./ or ../. For example, if notebookA and notebookB are in the same directory, you can alternatively run them from a relative path. For more complex interactions between notebooks, see Notebook Workflows. After you attach a notebook to a cluster and run one or more cells, your notebook has state and displays results. This section describes how to manage notebook state and results. You can download a cell result that contains tabular output to your local machine. Click the button at the bottom of a cell. 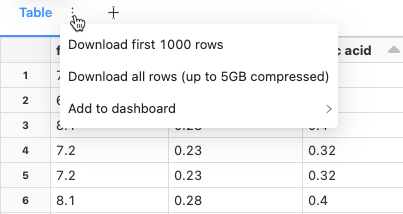 A CSV file named export.csv is downloaded to your default download directory. Cell content consists of cell code and the result of running the cell. You can hide and show the cell code and result using the cell actions menu at the top right of the cell. Since all notebooks attached to the same cluster execute on the same cluster VMs, even with Spark session isolation enabled there is no guaranteed user isolation within a cluster. Variables and classes are available only in the current notebook. For example, two notebooks attached to the same cluster can define variables and classes with the same name, but these objects are distinct. To define a class that is visible to all notebooks attached to the same cluster, define the class in a package cell. Then you can access the class by using its fully qualified name, which is the same as accessing a class in an attached Scala or Java library. Every notebook attached to a cluster running Apache Spark 2.0.0 and above has a pre-defined variable called spark that represents a SparkSession. SparkSession is the entry point for using Spark APIs as well as setting runtime configurations. Spark 2.0.0 and Spark 2.0.1-db1: notebooks attached to the same cluster share the same SparkSession. Runtime configurations set using spark.conf.set or using the SQL set command affect only the current notebook. Configurations for a metastore connection are not runtime configurations, and all notebooks attached to a cluster share these configurations. Setting the current database affects only the current notebook. Temporary views created by dataset.createTempView, dataset.createOrReplaceTempView, and the SQL CREATE TEMPORARY VIEW command are visible only in the current notebook. 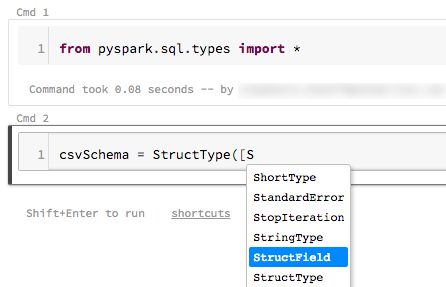 To enable Spark session isolation, set spark.databricks.session.share to false in the Spark Config field. Spark 2.1 and above: session isolation is enabled by default. You also can use global temporary views to share temporary views across notebooks. See Create View. To disable Spark session isolation, set spark.databricks.session.share to true in the Spark configuration. The graphs in streaming cells are not displayed. Jobs do not block as long as a stream is running (they just finish “successfully”, stopping the stream). Streams in jobs are not monitored for termination. Instead you must manually call awaitTermination(). Calling the display function on streaming DataFrames doesn’t work. Cells that trigger commands in other languages (that is, cells using %scala, %python, %r, and %sql) and cells that include other notebooks (that is, cells using %run) are part of the current notebook. Thus, these cells are in the same session as other notebook cells. By contrast, a notebook workflow runs a notebook with an isolated SparkSession, which means temporary views defined in such a notebook are not visible in other notebooks. To access notebook revisions, click Revision History at the top right of the notebook toolbar. Click the Save now link. In the Save Notebook Revision dialog, enter a comment. Click Save. The notebook revision is saved with the entered comment. Click Confirm. The selected revision becomes the latest revision of the notebook. Click Yes, erase. The selected revision is deleted from the notebook’s revision history. Select File > Clear Revision History. Click Yes, clear. The notebook revision history is cleared. Once cleared, the revision history is not recoverable.